Again, I didn't think there was a lot that's notable in DC Comics's May 2014 trade paperback and collections solicitations, though there's some interesting comings and goings here -- Stormwatch and Batman: The Dark Knight bow out, while Charles Soule takes over Swamp Thing and Keith Giffen's Larfleeze gets a more complete collection than I might have expected. Let's take a look. Inasmuch as I felt lukewarm about Gregg Hurwitz's first Dark Knight Scarecrow story, I'm inclined to give this one a chance since I feel I've read fewer Clayface origin stories over the years than I have Scarecrow stories. This hardcover collects the final issues of the series. 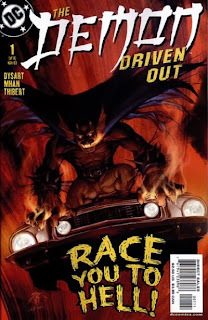 I can't really argue with a deluxe collection of Andy Kubert's art, but I feel I'd have been more enthusiastic about this series at the height of Grant Morrison's Batman run, and maybe before Damian's death in Batman, Inc. Vol. 2. I still find that a little tawdry, and so a new series starring Damian feels like more of a tease than a rebirth. For completists, the good news is that the first Larfleeze collection is solicited to include not only issues #1-5 of the series, but also the backup stories from Threshold. Between Sinestro, Larfleeze, Corps, New Guardians, Red Lanterns, and the Green Lantern book, I think DC's Green Lantern line is too franchised out for its own good, and I'd bet Larfleeze would be the first on the chopping block. Collects issues #19-24 plus the first annual, which details Arsenal's history with Green Arrow. I didn't favor a reboot of the New 52 Stormwatch, and with characters like the Weird it seemed too much to me like Jim Starlin was doing his own thing (and some of the villains, it seemed, were hopelessly 1990s inspired); all of this made me hesitant to keep following Stormwatch for volume after volume. However, what turns out to be the final Stormwatch collection includes twelve issues, #19-30, and takes care of Starlin's run in one shot; given this, and Stormwatch's presence in Futures End, I'll probably stick around. The solicitations says this hardcover collects Action Comics #19-24 and the backup from Superman Annual #2, though if I don't miss my guess I think it's the main story from the annual, tying in to "Psi War," and not the "World of Krypton" backup. As you know, Andy Diggle was supposed to take over Action Comics with the beginning of this trade, but Scott Lobdell and others ended up writing it instead. This collection also includes the Superman/Wonder Woman story from Young Romance. At this point, the only story from Young Romance that hasn't been collected is the Aquaman story. Begins Charles Soule's run on Swamp Thing, and includes the Villains Month issue #23.1: Arcane. I thought I had read that Paul Levitz was leaving Worlds' Finest, but in looking at this collection's contents, #13-18, I see Levitz is still on the title as of issue #19. The next trade crosses over with Batman/Superman. Collects the 2013 Batman: Black and White six-issue miniseries. It really is enough to make you think DC is planning a new Demon series, with the collection of the four-issue Demon miniseries by Matt Wagner earlier this year, and now this DC Comics Presents edition of Joshua Dysart's six-issue "Driven Out" miniseries. Odd that this is DC Comics Presents and not just a collection, though maybe DC's hedging its bets by keeping the price down. As we discussed when this volume was first solicited, it includes JLA issues #47-60 and the originally-oversized JLA: Heaven's Ladder. These JLA paperbacks, you might know, don't correspond to the JLA hardcovers; this book collects the end of Mark Waid's run, though the beginning, "Tower of Babel," is found in the paperback JLA Vol. 4. Some years back there were a couple of Showcase Presents volumes that were subsequently canceled because of rights issues, but we're now beginning to see them emerge; among them was this Showcase Presents: The Great Disaster Featuring the Atomic Knights. I had more interest in this at the time, circa Final Crisis, than I do now. We talked about this one earlier, too; if the contents hold up, it contains Batman #526 and #550, Legends of the Dark Knight #86-88, and the "Pulp Heroes" Annual #21, all written by Doug Moench; #667-669 by Grant Morrison; "Snow" from Legends of the Dark Knight #192-196 by Dan Curtis Johnson and Williams with art by Seth Fisher; Detective Comics #821, by Paul Dini, and Chase #7-8, which guest-starred Batman. Those are my picks. What are you looking forward to reading this May? • Jeph Loeb and Tim Sale: Yellow, Blue and Gray HC—These three graphic novels are often considered to be some of the best Daredevil, Spider-Man and Hulk stories, respectively. Jeph Loeb has lost a lot of his prestige, but this omnibus-ish edition should still hold up. • Marvels: The Platinum Edition HC—Y’know, if you’re going to charge $200 for this, why not put in the “Eye of the Camera” mini-series as well? Or even “Ruins”? I really don’t get the appeal of this at all; just get the original trade, it’s well worth it. • Avengers Assemble: The Forgeries of Jealousy TP—Speaking of “Ruins”, Warren Ellis is Kelly Sue DeConnick’s collaborator on this final volume. It’s since been supplanted by “Avengers World”. • Amazing X-Men: The Search for Nightcrawler TP—This is all Matthew Vaughn’s fault for putting Azazel in “X-Men First Class” in the first place. If not for that, we could have all forgotten about him and Austen’s “Uncanny X-Men” run. Instead, not only am I going to probably get this interesting looking book, but it’s also given me the impetus to finally review “The Draco”. In the words of Norman Krasner: ungh. • Revolutionary War TPB—This crazy jumpstart of Marvel’s dormant British properties is worth a look just for the Death’s Head stuff. • All-New X-Factor Vol. 1: Not Brand X TPB—So Peter David has a stroke and Marvel announces the cancellation of “X-Factor”… only for David to relaunch the title with a new aim and a few new characters. Well-done, Marvel. Here’s hoping David’s health stays steady. • Marvel’s Guardians of the Galaxy Prelude TPB—Normally I don’t get the movie prelude trades, but since the collections for Abnett and Lanning’s series are a nightmare to figure out (just about all of them are part of other crossovers), this might be a good place to start. • Devil Dinosaur by Jack Kirby: The Complete Collection TPB—I’ve never been the biggest Kirby fan; I appreciate him, but things like “The New Gods” never really grabbed my attention. But put a cave-boy on a gigantic red dinosaur and somehow, you’ve got magic. For a full-on mindscrew, read this directly after reading “Nextwave”. Oh yeah, baby! Jeph Loeb and Tim Sale: Yellow, Blue and Gray HC must be mine. My one gripe is that there aren't any special features listed for that "Marvels" apart from an Alex Ross art gallery. If you're going to charge that much for five issues, at least include some in-process drawings and scripts like they have in the IDW Artist Editions. Maybe they'll announce some extras soon? • Harbinger Wars HC—This was the first major crossover of the new Valiant, and while the Harbinger and Bloodshot titles aren’t my personal favorites, reading “Unity” has gotten me interested. • Robocop vs. The Terminator HC—This is just glorious. I’m kind of amazed that this mini by Frank Miller and Walt Simonson has never been collected before. The artist’s edition sounds cool too, but I’m not sure anything can beat the one for “Alien”. • The Star Wars TP/HC—As much as I’m looking forward to this, I’m not paying twice as much just to get an extra issue. I’ll grab the TP and get issue 0 online. • The X-Files: Conspiracy HC—I’m mostly getting this for the “Transformers” issue, but consider this: a book actually exists featuring the Crow and the Teenage Mutant Ninja Turtles within it simultaneously. • Nothing’s standing out for me from Image, although it’s weird that there are no hardcovers coming out in May from them at all. Doug, have you heard of any more Superior Spider-Man Deluxe HCs coming out? I really enjoyed Volume 1, which collects Amazing Spider-Man #s 698-700 and Superior Spider-Man #s 1-5, and would like to continue getting deluxe versions to match it on my shelf rather than getting the trade paperback volumes. I haven't heard or seen anything that indicates that a Volume 2 is on the way, though. Hmm... I would've predicted Volume 2 to come out in May to tie into the release of "Amazing Spider-Man 2". I'll keep a look out for it in June. The Deluxe hardcovers aren't the fastest produced; the one for Deadpool came out about a year after the trades within it were released. Thanks guys. I must have completely missed it in Marvel's solicitations for April. I'll wait for that one to come out in softcover. nothing really stood out for me, either. i'll wait and place my order from this month's solicits next month. the Showcase Presents looks good, as does the Demon series, Red Hood, and Swamp Thing, maybe JLA. some rumors going around on CBR that the Showcase Presents are done with the ones solicited over the past few months. hope that's not the case. i really enjoy reading them. The JLA trades are starting to really piss me off. The hardcover for volume 4 had Morrison's Earth 2 and his JLA: Classified arc. The softcover does not include it. Why not put them in there instead of Waid's first arc? Agreed! They could have waited to the start of Waid's run and release a couple of big books. Heck, they could have released the first 4 with the same contents of the deluxe books, and THEN released a JLA by MARK WAID omnibus!! If the point of those TPBs is to reprint the whole JLA series in chronological order, then Morrison's JLA Classified arc (which is set some time after Kelly's run) should not be in volume 4, but I agree about Earth 2. Can anyone tell me what JLA vol 4 (the softcover predecessor to Vol 5 listed above) contains? I really want Tower of Babel in my collection but want to know what else is in that book? Is the Earth 2 one-shot in there? Swamp Thing is the only book I'm interested in from the above. I'm hearing good things about Larfleeze, but for me too much of him isn't for me. And as someone mentioned above, I wonder when they'll either release a Batman Inc Omnibus or a Batman Inc New 52 Deluxe containing the entire 1-13 run. In addition to Tower of Babel, JLA vol. 4 includes the last 7 issues of Morrison's run and two fill-in issues written by J.M. DeMatteis and D. Curtis Johnson. It doesn't include the JLA: Earth 2 graphic novel. They also omitted the Secret Files and 80-page specials that were in the original TOWER OF BABEL paperback. Disappointing. I forgot to add that JLA vol. 4 also includes two fill-in issues by Waid (#32-33), the first of which was co-written by Devin K. Grayson. I'm glad I got all the old JLA trades Morrison-Waid. Unfortunately there's no point to getting any after that. I heard that the new trades are including the Secret Files and stories from the 80pg giants that were not in the earlier printings of the trades or the deluxe HCs - at least, the solicitations for Vol 1 of the paperback editions said so. Are there any 'missing' stories included in the later volumes? I have heard that the Secret Files stories which significantly tied in to the 'Tower of Babel' storyline have been omitted from JLA Vol 4. I have all the earlier trades as well, so looking whether there is anything that should make me pick up the new paperbacks. As you can see, even the new TPBs are missing some stuff. I'm still buying them, but I'm keeping my old Tower of Babel TPB because of the content from JLA Secret Files #3. And if you want the last two pages of JLA #23, the third deluxe HC is still the only collection that includes them, and reportedly even that issue's digital version omits them. What are the last two pages of issue #23 that get omitted in so many places? They show Wonder Woman coming back to the team and Hippolyta leaving, followed by the arrival of Justice Legion A from the 853rd century. DC One Million #1 picks up from that cliffhanger. Well it makes sense those 2 pages would be cut out, Batman and Superman just start making out - it's crazy! No apparently it has something to do with kicking off JLA One Million. Not sure why they'd cut the pages out, but are they included in the One Million Omnibus, I wonder? I also hoped those pages would be included in the DC One Million Omnibus, but they unfortunately weren't.